The Antidyn Files: Don't waste your vote. This is a double post tonight, to compensate for the fact that I did not post last week. The reason for this is because my computer broke down. 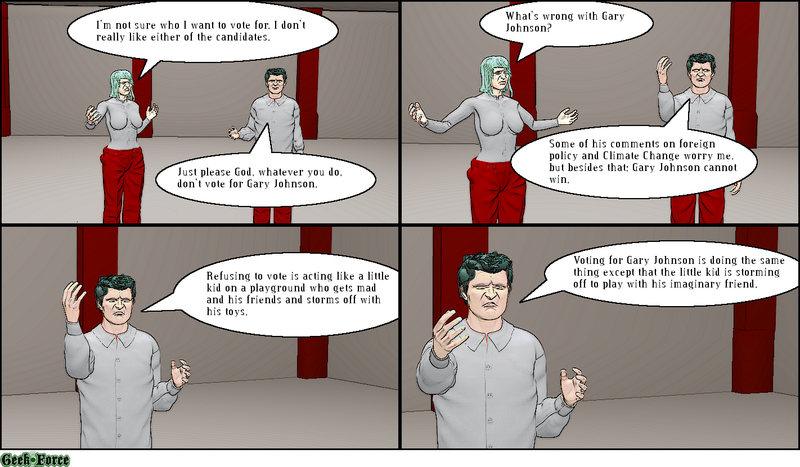 The first of tonight's comics concerns Gary Johnson. I sought to criticize him because I believe voting third party does not fix any problems in our Republic. I would like to see a system in which third parties can be competitive, but the way the system is built, it isn't possible right now. We would have to enact more systemic changes to make that effective. I would propose abolishing the electoral college first, since three way battles are more likely to prevent any candidate from winning an outright majority and thus send the election to the House of Representatives. I do have problems with Gary Johnson. The fact that he didn't know what Aleppo was or the fact that he couldn't name a foreign leader troubles me. The fact that Johnson also said that Climate Change should be ignored because the sun will engulf the Earth is also troubling. Still, I have a certain softness in my heart for Libertarians. I used to consider myself a Libertarian. I still hold many of the same views now as I did back then. I like Libertarians on social issues. I agree with them on many, but not all foreign policy positions. I would like to see a less aggressive United States, but one that still provides some leadership. I eventually came to disagree with the Libertarian stance on regulations, however. I disagree with them on the ability of the market to correct itself. I also disagree with their views on State Rights, and I think certain things should be provided by the government for all citizens like healthcare and education. I believe in some welfare programs. More important than my disagreements with Libertarians, however, are my disagreements with Donald Trump. He would be a horrible president, and we must vote for Hillary Clinton to prevent him from taking office. As for the other comic. This is my defense of voting. It was always my observation that old conservative men were the ones who encouraged me to vote. It seems like a conservative, patriotic thing. It also seems like these people always get what they want. Does voting always guarantee we get what we want? Of course not. Should it be our only means of redress? Of course not. No right alone is enough to create a Democracy. That's why we have many rights. We can protest, we can use our Free Speech rights, our right of privacy, but don't forget our right to vote. The issues we face are too great to leave aside any tool with have at our disposal. We should hit our nation's problems with every right we have.